First, there seems to be something in us that either doesn’t want to be better or makes it really hard for us to become better. Christians in the past have called this “Sin”. They’ve pointed out that it’s both in us and around us and leads us and the people around us to do the bad things they do and keep us from becoming better people and loving God more. Second, as we get older, we realize that we have sort of a short time on this earth to become those people we want to be. We’re all going to die. The fear of this sometimes keeps us from fighting hard to know God better and become like him. So Sin and Death are our two greatest enemies. But the good news of Christianity is that God knows how hard it is for us to be the people we want to be, and he came and conquered Sin and Death at his Resurrection. This is what we celebrate at Easter. But to really celebrate something takes time and preparation. And that’s what Lent is for. We take this time to see the sin in our own hearts and minds, we see the sin and badness in the world around us, and we think about the fact that we’re going to die. And all of this reminds us of how much we need God. And it all starts tonight, on Ash Wednesday. This is when we put on our bodies an outward symbol of both our weakness and God’s answer to it. We wear the ashes to mourn our sin and the fact that Jesus died because of it; we wear them to remind us we’re going to die; and we wear them to proclaim to the world how God has responded to everyone’s sin: by coming on the Cross and dying for us. So tonight, we’re going to sing some songs, pray some prayers, have some moments of silence, and get the ashes put on our foreheads in the shape of a cross. And we’re going to do this together to remind us of how weak we are, but also how strong God is. And this is what we’re going to keep on doing through Lent. “Unitarian” (as in, “Not-Trinitarian”) the Holy Spirit makes no appearance in this explanation, and there’s nothing inherently “divine” about any of the actions I talk about with Jesus. What do you all think? Would you be happy walking your kids through this? Why or why not? Am I just being too over-analytical and hard on myself? 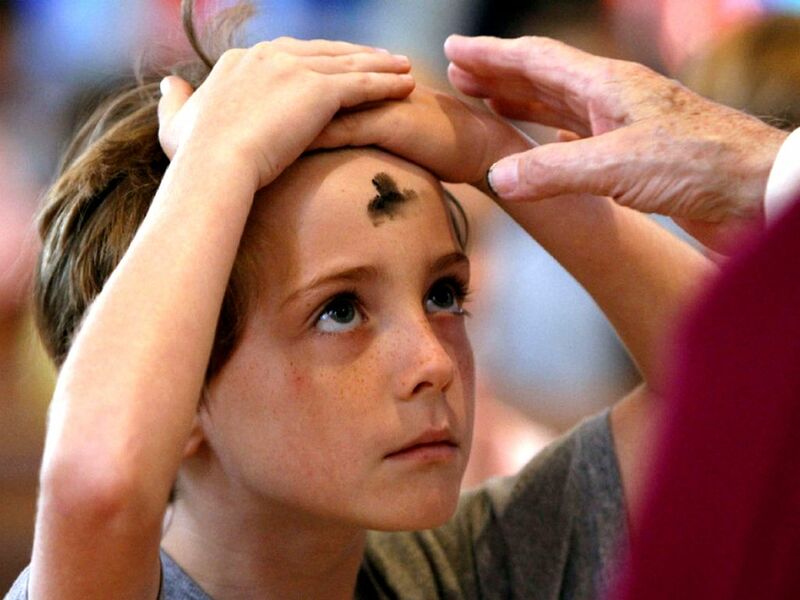 How would YOU phrase it and explain Lent and/or Ash Wednesday to kids? Leave your thoughts below. I probably would not focus on “being better.” With my kids, I have kept it pretty simple. I tell them that Lent is a window of time where we give special attention to the practice of turning back to Jesus (what we call repentance in our home) instead of turning to our idols and escapes. I talk through with the girls the things that they run to for comfort instead of turning to Jesus and that is what we give up. I give up Simply Cookie chocolate chip cookie dough because I pretty consistently turn to that specific food when I am burdened or stressed. Lily said she turns to a glass of milk to comfort her instead of going to the Lord. We want to feel these burdens acutely during this time (not escape them), so that we are forced to go to the only one who can lift the burden and wash us clean. It the most dust-like human impulse to worship and turn to some other god rather than the one who made us. I also connect Lent to the story of Jesus 40 days in the wilderness. . . there is a lot there too. Ash Wed is the tangible reminder, just as you said, that we are weak and He is strong. We remember that our “clothes” are dirty and torn (so we can’t “be better” no matter how hard we try) and we don’t have any pretty dresses hanging in our closet – our “clean beautiful clothes” are Christ’s very own that he wore triumphantly on Easter as emerged from the grave. Oh I love that. The focus should definitely be on Christ, his suffering, and his faithfulness. We should get you up there doing the liturgy! I had a three-year-old friendly coloring book with us last night that was used for the majority of the service, except when you were speaking, Paul (no offense Jared…). J said she “knew what you were talking about” during the opening, and I could see her actively listening and processing. Thanks for being thoughtful and looking for ways to include our kids. Helpful for all of us. Wow. Thank you so much for that encouragement.